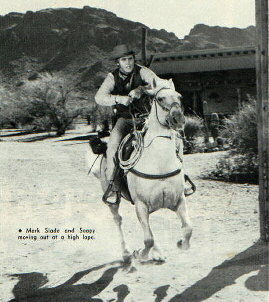 Mark Slade and Cameron Mitchell on Soapy and Rebel. 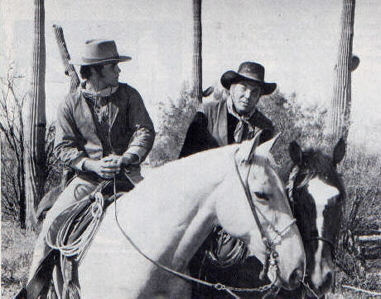 When The High Chaparral, one of television's newer Westerns, originally arrived on the air, it emphasized authentic presentation. Creator David Dortort has continued this emphasis on realism by filming 80 percent on location in Arizona's "Old Tucson," (often in 110=degree weather), by using Indians for Indian roles, and by demanding scripts backed by research and knowledge. As a result, the series has become a favorite. The southwest is an area rich in history and varying cultures, with some of its country little changed in the past 100 years. Therefore, it is ideally suited as the site for a Western with a different look. The series takes place in the early1870's, which was a violent and interesting time --- one which brought drastic change to the history of the area. Apaches, Mexicans, and Americans were fighting each other for survival and the land they felt was theirs. Dortort, long a student of western history, felt when creating the series that Indians have received unjust treatment in many Hollywood Westerns. He tries rectifying this in High Chaparral by presenting his Indians with more than the usual one-sided approach. Also realizing the strongly-evident Mexican presence and cultural contributions, Dortort created the Montoya family. Two members of this family exert strong influence on the series. Henry Darrow (born Delgado), a native of New York who matured and attended college in Puerto Rico (his parents' native home), portrays Manolito Montoya with understandable authenticity. Although his speech is accent free, Henry dons his Mexican accent easily when he slips into his role. Dashing and carefree as Manolito, Hank is personally more serious-minded, yet relaxed and candid. The dark-eyed, dark-haired actor attacks his role and career with intelligent concentration. This includes his riding, which he has learned during the series. 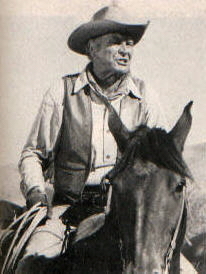 "When the series began," Hank recalled, "I thought I knew how to ride. I had taken some lessons a few years earlier doing a Wagon Train segment. I got so I could do the ride-in and ride-out-of-town scenes. However, with all the riding High Chaparral requires, I found I had a lot more to learn. So I spent a couple of months taking lessons from Stevie Myers. "Then I spent the first year just worrying about getting the horse where he belonged. It was all mechanical. I had to think about each thing I had to do. I spent a lot of time practicing and working up to things gradually. I had to gain confidence in myself and in handling the horse. The stunt men and wranglers are a big help. They give me suggestions about what I can do to make things easier and more natural. "During the first year, I rode a black horse named Diablo. But he was too excitable, so I changed to a ten-year-old sorrel I call Macadoo. I liked the sound of that. Mac is a much better filming horse. "Now riding is becoming second nature for me. Mac knows me and my reactions and I know what he is going to do. So I think I'm improving, at least I feel better. I'm more relaxed and more comfortable in handling Mac. Also I'm more concerned about how I look when I'm doing something. In my role as Manolito, I'm supposed to be a horseman and I want to look as well as feel the part. "I'm learning how to rope and to handle a whip on horseback. Mac doesn't like the idea too well, but we are going slowly and he's getting used to it. Mac is a great horse, but there are two things he doesn't like. One is a mike coming at him from the side, and the other is a wagon. He absolutely won't go near a wagon. We've worked with him and he's much better about the mike. We've also spent a lot of time with him around wagons, but he still won't go near one. So, in a wagon scene we automatically use his double -- a horse named Flax. "I ride Mac all the time and my double usually rides Flax. In this way neither horse gets too tired and each horse is used to one rider. I'm getting so I do more of my own riding. But if I can't feel relaxed when doing a scene, like when I have to race down a steep hill dodging boulders, I let my double do it. I hurt my back when I was a kid and if I get up tight when riding, I'm laid up for a few days and can't ride at all. It slows up production. "Mac is a great dialogue horse. He's kind of funny if you watch him. He comes into a scene with his ears up, all ready to go. As we begin talking, his eyes slowly close and his head begins to slowly droop, until he's asleep. Watch him. A couple of times we've worked this into a comedy routine. "I enjoy working with horses and filming on location. I would rather work in Arizona than on the sound stage. You have to be patient when filming with horses because they can do things which will ruin a scene. "My wife and I have enjoyed riding. Since the series, my interest has increased. Now my daughter wants a horse. I want a couple of horses, but I want to keep them myself. We're looking for a place now which has room for horses." 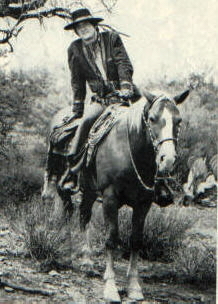 Leif Erickson, as John Cannon and head of the High Chaparral, portrays a man of vision around whom history is often made. Cannon feels the intrinsic rights of all and strives toward an alliance where all can live in peace, each in their own way. Therefore his marriage into the Montoya family was not surprising. As John Cannon, Leif is a stern, imposing figure. But in reality, the tall, broad-shouldered actor is openly enthusiastic and outgoing. "I've done a lot of Westerns before this came along," he states. "My first was in '34 when I did a film, Wanderers of the Wasteland, based on a Zane Grey book. "That was when I learned to ride. Strangely enough, it was Stevie Myers' father who taught me. "I enjoy riding for the series. I have a good horse, a bay named Billy, that's about 14-years old. I like doing the series, and I don't mind the long hours or the heat when on location. You get used to it. You have to! It's harder to film on location, though, because you can't control the climate and it's harder to concentrate. It's a good series to be with, though." 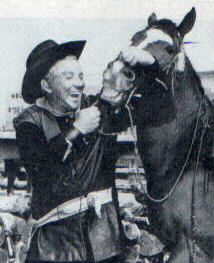 Cameron Mitchell, who portrays Buck Cannon, the incorrigible younger brother, has been riding in Westerns for some time. "I guess Gallant Bess in 1949 was my first Western. The horse in that film was remarkable. She knew a couple hundred verbal commands." "I ride Prince, an 11-year-old bay. He's a smart horse --- smart enough to occasionally get impatient with all the fooling around required when filming. He can steal a scene, too. I'll be doing dialogue and he'll come up and nibble my sleeve or rub his head. "I kind of spoil him, giving him sugar and things. His special favorite is watermelon. He really loves that. He's a great horse and I enjoy riding him." "I've been riding since I was a kid," states husky, blue-eyed Mark Slade, known as Billy Blue Cannon on the series. "However, it was English. My aunt had show horses back east and I used to ride them. I had to learn Western for the series. Henry Wills taught me. "I ride a palomino named Soapy. He's about nine and he's a good horse to ride --- real smooth. "I've enjoyed doing the series, especially since they have let my character grow up. It is more interesting." 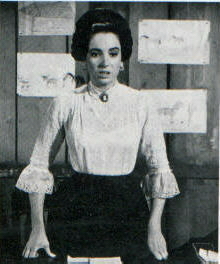 Linda Cristal, a dark-eyed native of Argentina, portrays Victoria Montoya Cannon. Although the actress had ridden before, she had to learn sidesaddle for her role. She seldom rides in the series, thus has no special horse. Starring horses for the series come from the Myers and Wills stable in California which is owned by Stevie Myers. About 14 horses travel between California and Arizona locations. This includes the starring horses and their doubles, plus several stunt horses. Extra horses needed in Arizona are acquired through Vernon Mounce. "With High Chaparral, we take pride in doing things correctly, states producer Jim Schmerer. "That's why we film mostly on location. This gives a realistic flavor. We use Apache Indians from the San Carlos Reservation. They are cowhands and can ride. Our cowboys are cowhands from nearby ranches. The cattle or horses they're handling may be from their ranches. Things look authentic because they are. "We don't have the soundstage look. When we want to work 100 horses, we go out and work 100 horses. When the actors sweat, it's because it's 100 degrees outside. This is how we're different." Director Phil Rawlins is a horseman, former stuntman, and current rodeo competitor in the calf roping and team roping events. He helps High Chaparral retain its realism. Although different episodes are directed by different men, Phil is called to direct those which require involved battle scenes or complex riding. His knowledge and experience come in handy. These types of scenes can only be done by someone familiar with horses and their use. Henry Wills, stunt coordinator and second unit director, also keeps things authentic. Making sure the right saddle is used in a cavalry scene, correcting dialogue, and adjusting horses and riders to suit their personalities are but a few of his duties. Henry also performs stunts. More than once he and his son have battled each other before the cameras while stunting for actors. "It takes more time, trouble, and money to film the way we do," states Schmerer, "but no other Western show on television has the look of High Chaparral." And therein lies one reason for the success of the series.